I have little faith in demographic conversion. Population is a problem we must find a way to manage, or it will manage us. The previous two posts have focused on the size of the world’s population and why it matters. This post will draw out additional implications. In 7.4 Billion and Counting I reported that as of the date I wrote that post the world’s population was 7,409,620,694, and that it was increasing by more than 2 every second. That’s a million people every 4.8 days. 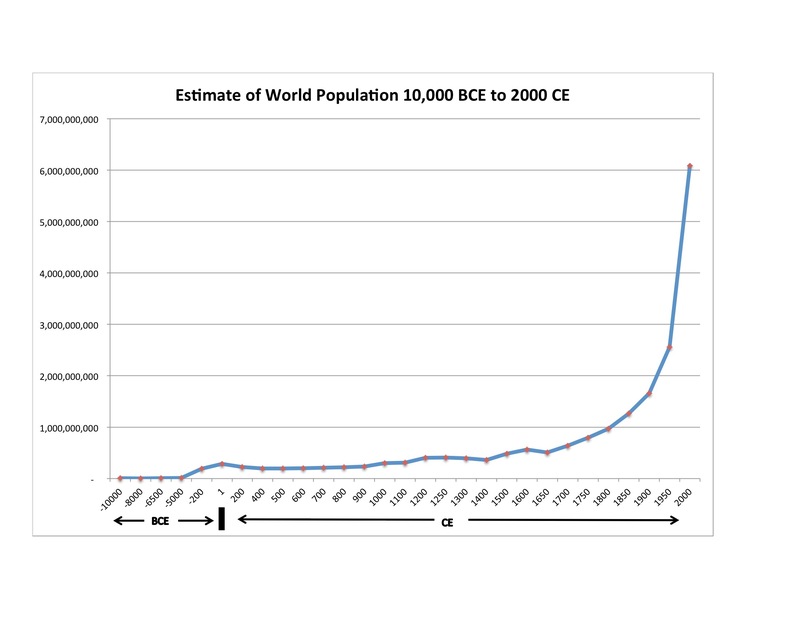 I published Figure 1, which shows that for 11,000 years of human history, the population grew relatively slowly. In the last 250 years, however, it has spiked upward, and we added the last billion in only 13 years. What happened? In Why Does World Population Matter? I reported that only two factors affect world population: births and deaths. If you want to add to world population, then you must either have more births or fewer deaths. Population spiked during the last 250 years because the death rate decreased, especially the rate of infant mortality. This change occurred because of improvements in farming, leading to an increased food supply, but especially because of improved public health and medical care: sewers, proper food handling and storage, immunizations, and advancements in childbirth – those sorts of things. With fewer people being removed from the world by death, but birth rates remaining the same, the population spiked. Figure 2. 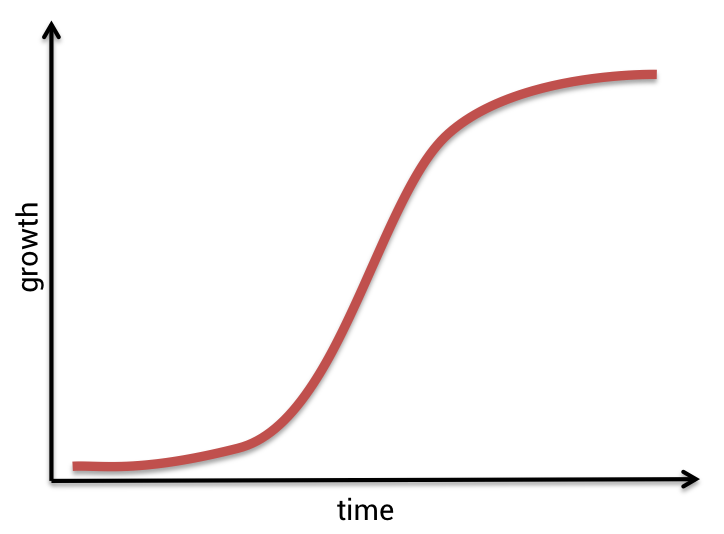 An S-Curve Describes Population Growth Over Time. Source: Brodnick 2016. In Why Does World Population Matter? I published Figure 2. It shows that over time population increases ever more rapidly until resource scarcity limits it. This point is called the carrying capacity. As population approaches carrying capacity, one of two things happens: individuals become too unhealthy to be able to bear children, or the death rate increases. Either represents a substantial uptick in misery and suffering. The implication is that for any given level of resources, if left unchecked, population will expand to consume all of the available resources. If one wishes to avoid an increase in misery, suffering, and death, then only two options are available. One is to reduce the birth rate. The other is to increase the amount of resources available. Unfortunately, based on the same reasoning, once that new level is reached, then population will inevitably expand to the new carrying capacity, and misery will increase again. This tendency became known as the Malthusian Trap, named after John Malthus who originated the idea. Malthus wrote in the late 1700s, and he focused principally on the availability of food. In the 1960s, Paul Ehrlich adopted Malthus’s reasoning. Writing in the mid-20th Century, he expanded the analysis to include other environmental stresses besides food. Both Malthus and Ehrlich predicted imminent catastrophe from expanding human population. Figure 3. Source: Our World in Data. Aside from reducing the birth rate, the only other option is for technological progress to outrace population growth, to constantly increase resource availability faster than population increases. Both Malthus and Ehrlich believed that the race was about to be won by population growth. Both were wrong, at least in the short run. Humankind has proved remarkably adept at winning this race – so far, at least. Technological advances have increased food availability throughout the world, and also the availability of most of life’s necessities. 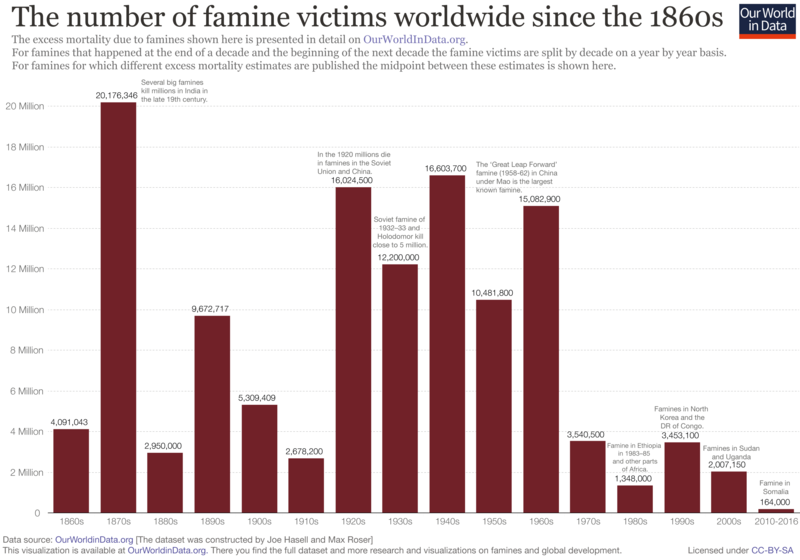 To take only one example, despite the impression you get from the headlines, famine has not increased; if anything, it is at an all-time low (Figure 3). Figure 4. Source: World Bank. In the mean time, an interesting thing occurred: as standards of living increased, the birth rate decreased (Figure 4). In 2015, only 19.7 children per 1,000 people were born, compared to 36.1 in 1963. This trend is universal: data was available for 196 out of 217 nations, and in every one of them, the birth rate fell between 1960 and 2015. Demographers call this change demographic conversion, and attribute it to many factors. Perhaps primary among them are reduced child mortality and the availability of birth control technologies. If the chances are good that children will survive to adulthood, then you don’t have to have so many, and the ability to put that choice into action is available. Figure 4. Data source: U.S. Census Bureau. Some writers place great emphasis on demographic conversion, arguing that nothing needs to be done to control population; it will control itself as living standards improve. 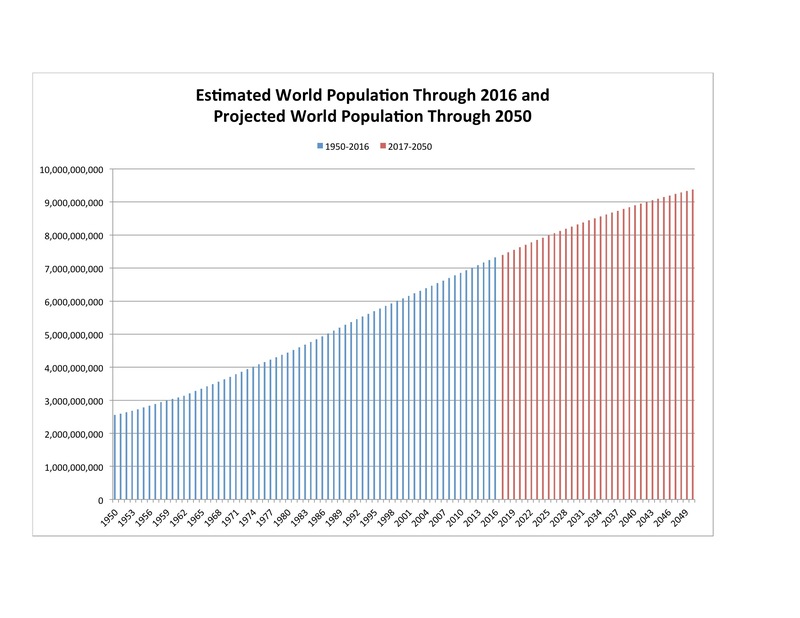 On the other hand, Figure 5 shows historical world population from 1950 to 2016, and projects it to 2050, with the historical data in blue and the projections in red. Looking carefully, a small flattening of the curve can be seen in the projected data. This is the vaunted demographic conversion. It is not evident in the actual historical data – it is only a projection. Look how small it is! Even if it occurs as projected, population will grow from 7.4 billion to 9.3 billion by 2050. If that is control, it is hard to imagine what uncontrolled means! In Why Does World Population Matter? I reported on work at the Stockholm Resilience Center that suggests there are 9 ecological thresholds we cannot cross without degrading the capacity of the earth to support life. We have already crossed two of them, and are approaching others. It may be that technological progress has not actually been winning the race against population, but rather borrowing from the future to stave off disaster now. I don’t personally find the theory of demographic conversion very comforting. I believe (and it’s a belief, not an established fact) that the environmental stresses piling up around the world indicate that we have already passed the carrying capacity of the earth. Ecological changes, such as the depletion of the oceans, destruction of coral reefs, species extinction, desertification, and climate change are signs that we actually are losing the race to outpace population growth. I believe that we not only have to reduce population growth, I believe we have to reverse it: we have too many people already. To suggest such a thing is fraught. It offends people values, and it raises very thorny economic and social justice problems. But, I believe, we will either manage this problem or it will manage us via an increase in misery, suffering, and death. Hasell, Joe, and Max Roser (2017) “Famines”. OurWorldInData.org. Downloaded 8/22/17 from: https://ourworldindata.org/famines. Lam, David. 2011. “How the World Survived the Population Bomb: Lessons ffrom 50 Years of Extraordinary Demographic History.” Demography, 48(4):1231-1262. Downloaded 8/20/2017 from https://www.ncbi.nlm.nih.gov/pmc/articles/PMC3777609. World Bank. 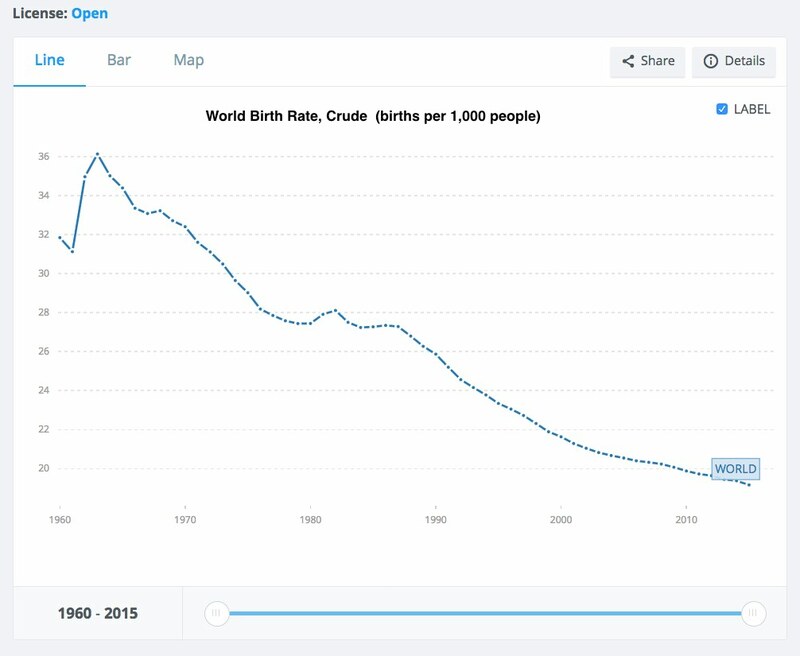 Birth Rate, Crude (per 1,000 people). Downloaded 8/20/2017 from http://data.worldbank.org/indicator/SP.DYN.CBRT.IN?end=2015&start=1960&view=chart. Historical World population data are from: U.S. Census Bureau. World Population: Historical Estimates of World Population. https://www.census.gov/population/international/data/worldpop/table_history.php. Steffen, Will, Katherine Richardson, Johan Rockstrom, Sarah Cornell, Ingo Fetzer, Elena Bennett, R. Biggs, Stephen Carpenter, Wim de Vries, Cynthia de Wit, Carl Folka, Dieter Gerten, Jens Heinke, Georgina Mace, Linn Persson, Veerabhadran Ramanathan, B. Reyers, and Sverker Sorlin. 2015. “Planetary Boundaries: Guiding Human Development on a Changing Planet.” Science, 1/16/2015. Downloaded 8/13/2017 from https://stockholmuniversity.app.box.com/s/v8q2noqkkwk60o3uikyuy3txr7ifycc8. USA population data prior to 2000 are from U.S. Census Bureau. Part II. Population of the United States and Each State: 1790-1990. http://www.census.gov/population/www/censusdata/Population_PartII.xls. USA population data for 2000 and later are from U.S. Census Bureau, Population Division. Table 1. Intercensal Estimates of the Resident Population for the United States, Regions, States, and Puerto Rico: April 1, 2000 to July 1 2010 (ST-ESTOOINT-01). http://www.census.gov/popest/data/intercensal/national/nat2010.html. By mogreenstats in Population on 2017/10/19 .